When original owner Scott Moore opened Subsonic Skateboards in 1999, he handcrafted every board. From start to finish, Moore would design, stain, press, cure, cut, sand, and polish every deck. But the growing popularity of Subsonic boards created a demand that Moore simply couldn’t keep up with. So in 2015, four more owners bought into the company, moving it from Portland, OR to its current location in Southern Seattle. 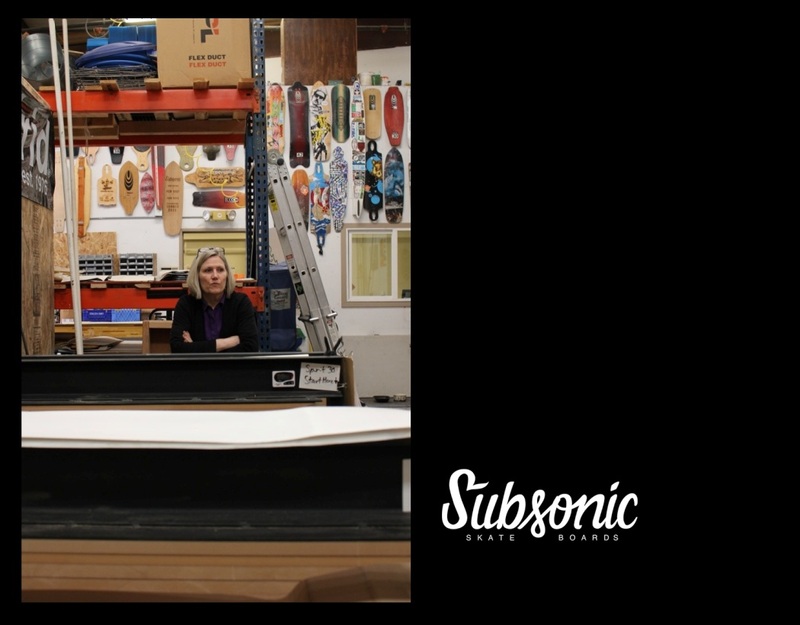 Left: Owner Anne Cameron, overlooking the gluing process at Subsonic’s manufacturing facility. Right: Subsonic’s trademark. I met Anne and her husband last month at Trader Joe’s, where I work. Between bagging organic dog food and fair trade goat milk, I told them about the rad skate magazine I intern for. They gave me some sick Subsonic stickers and told me to contact them if EverythingSkateboarding wanted to do a feature on a Seattle-based custom shop. 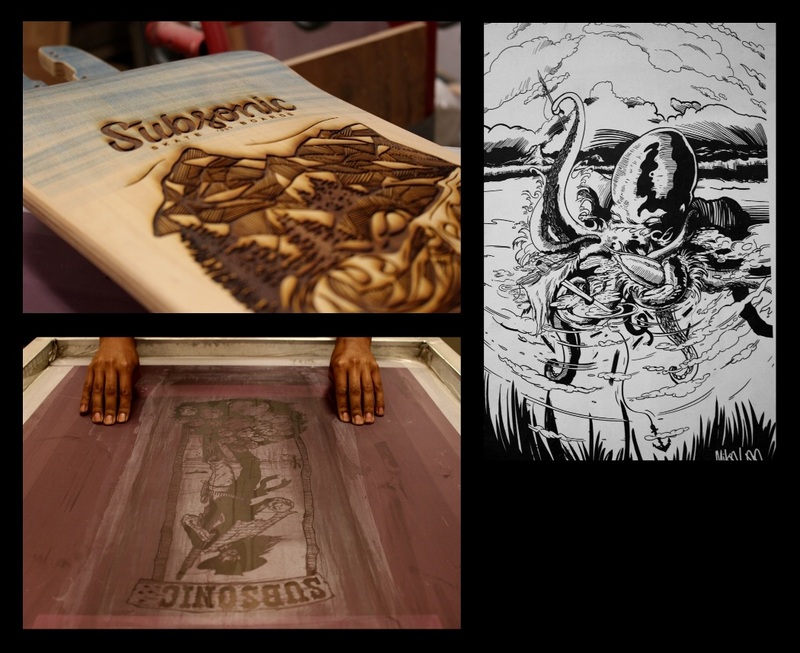 Subsonic currently has five owners, but the fellow most involved with the design and craftsmanship is Ryan Villa. 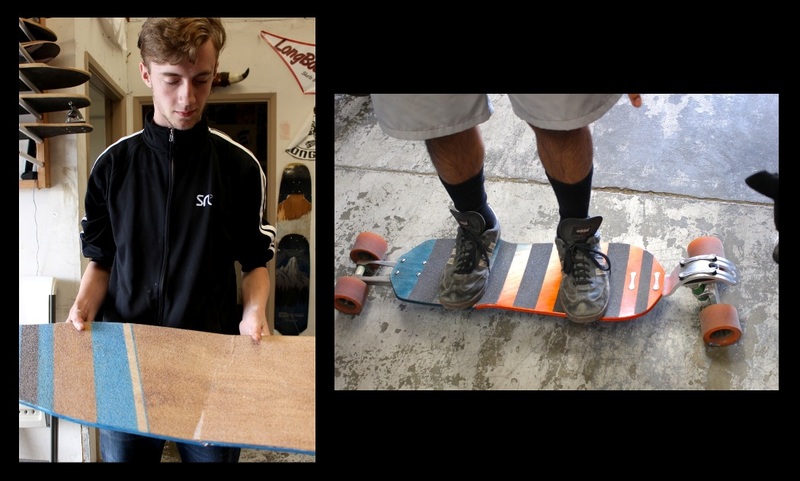 Ryan studied engineering, but left school when given the opportunity to design and engineer skateboards at Subsonic. The young longboarder is largely responsible for the creation of the boards, and was more than excited to show me every step of the process. The boards start as thin sheets of wood which are squeezed together with a hydraulic press. Ryan explained that although each mold corresponds to a specific board produced by Subsonic, they aren’t exact replicas, since the boards, once pressed, relax into their final shape. 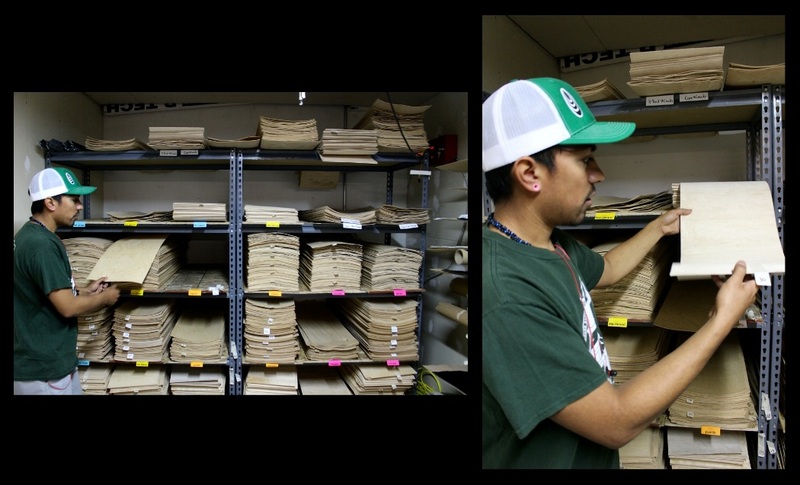 Left and right: Quality in, quality out; Ryan shows off the veneer. The planks of wood pressed together are meticulously chosen according to their grain. Depending on which way the grain runs, the wood will flex wither lengthwise or widthwise. Stacking these sheets of wood differently will therefore produce different levels of flexibility in a board. After being pressed, the wood sits in a curing room set to 73 degrees and 37% humidity to allow the boards to settle into their final shapes. Betty, Subsonic’s Computer Numeric Control machine, is responsible for cutting each longboard out. Drew, Subsonic’s intern, described how the sawdust is kept in huge bins which have to be systematically emptied- one of the less enjoyable tasks at Subsonic.“I was in full layers and I was still itching the day after.” Betty uses different drill bits to create the main shape for the longboards, as well as the smaller details. Ryan demonstrates how a round drill bit creates a detailed cut in one of the boards. “Even though a lot’s done on the machine, we still spend a lot of time hand shaping each board,” Ryan explained. In fact, every board is hand sanded after going through the CNC machine. Subsonic boards are sanded and shaped with tools custom made to fit the nooks and crannies of every unique board. Each Subsonic board is also hand stained, making even the standard boards inherently unique. Anne admits that the staining process is pretty therapeutic. “If you’re staining the wood you can just listen to music or a book on tape.” Drew claimed that he once stained planks of wood for three hours before realizing how much time had passed.Ryan and Drew make rings, medals, and tools out of scrap wood left over from the CNC machine. The final step is giving the longboards a graphic. Graphics are commissioned from artists outside the company, and range from more simple and abstract designs to elaborate animals, skulls, or even pirates. 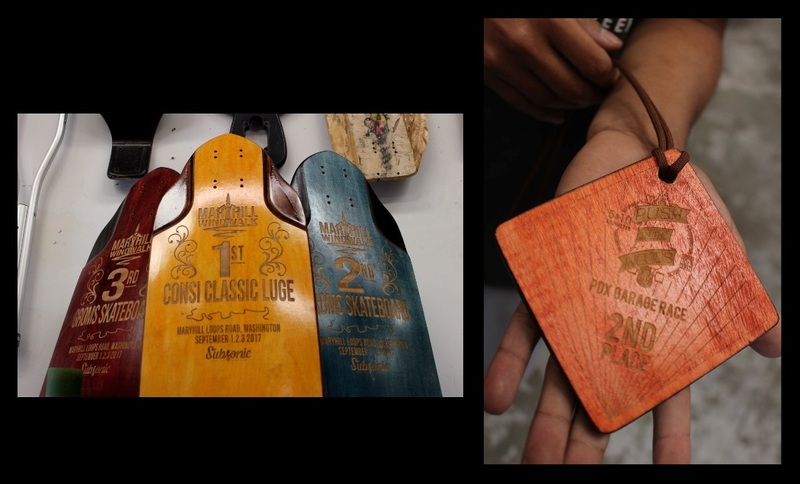 Most graphics are screen printed onto the longboards, but Subsonic also laser cuts some of their designs onto decks to create more scratch-resistant graphics. After graphics are added, each board undergoes a clear coating process. Between each coat, boards have to completely buffed in order to achieve the perfect glossy finish. Top left: Laser cut graphic. Bottom left: Screen printing screen. Right: Graphic by Subsonic artist. Left: “The Graveyard,” a wall of broken, discontinued, and experimental boards. Right: A stack of decks, fresh out of the CNC machine. Subsonic’s youtube page features recaps and features of their downhill team, who explore beautiful PNW sights while ripping down hills at upwards of 40 miles an hour. This might be the biggest difference between street/vert skating and downhill: the scenery. Ryan described a recent skating trip in Canada, where the hill him and his friends were riding down overlooked the some islands off the coast. Anne’s son is a downhill skater, and although she claims her skating abilities stop at balancing on a board, she knows first hand how welcoming the community is. “They’re just so inclusive. It’s like, ‘just wear your helmet and come skate with us!’” Although downhill skating is objectively terrifying (maybe it’s just me), Anne described how longboarding is incredibly diverse. Sure, there are downhill racers like Ryan, who get on a board in a full leather suit, ready to whip around hairpin turns at the speed of light. But there’s also pushers and pumpers, cruisers, and long distance guys like Andrew Andras. Andras holds the world record for the farthest distance traveled on a skateboard in 24 hours: 309 miles! Left: Intern Drew holding a personal project that met its demise. Right: A platform board prototype with metal brackets. 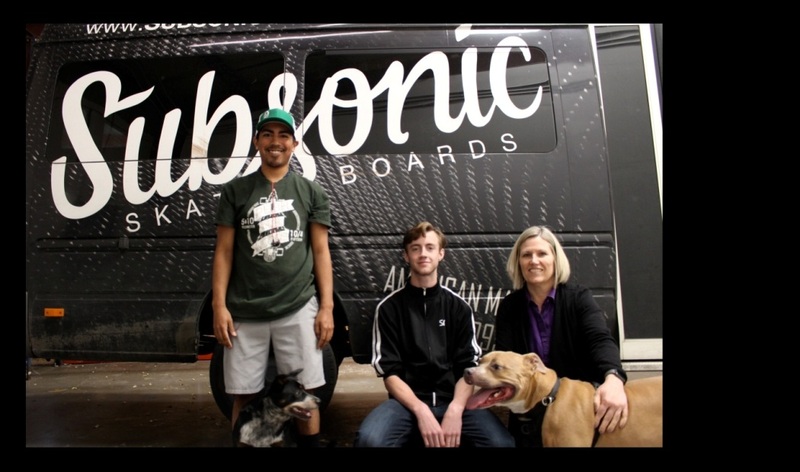 Subsonic is proud to manufacture all of their boards in the States. In regards to the current state of skateboarding, Subsonic’s owners know that more and more companies are becoming corporatized, shipping manufacturing overseas, and mindlessly pumping out boards. Ryan is optimistic, though, that Subsonic and other small custom shops will be able to stay afloat. Ryan, Drew, Anne, Penelope, and Cooper pose in front of the Subsonic van.